I am a rising senior at Campbell High School in Georgia. I am also enrolled in the school's International Baccalaureate program. Besides mathematics, I am also passionate about literature and Spanish, and although I will most likely be pursuing a future in programming and computer science, I do wish to incorporate those other subjects in my life. My extracurricular activities include the Math Team, Debate Team, Swim Team, Campbell Coding Club, and Beta Club, and my just-for-fun activities include reading voraciously, programming, writing, and of course video gaming. 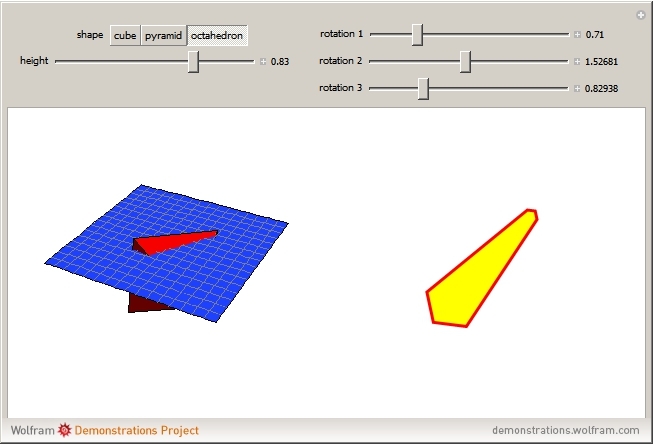 This Demonstration shows the various cross sections of 3D solids, specifically a cube, a four-cornered pyramid, and an octahedron. The 3D view of the object and a plane is presented on the left while the 2D image of the intersection of the object and the plane is presented on the right. By rotating the object and manipulating the plane's height, one can view all possible cross sections. The actual mechanism for generating the 2D cross section uses parametric equations of the lines that compose the edges of the solid. The equations are then set equal to h, where h is the height of the plane, to generate the points of intersection.